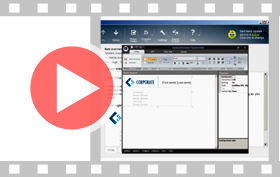 This software helps centrally manage email signatures and disclaimers in email messages sent from any email client or mobile device that flow through Exchange 2016 server in your organization. The program will let you create and control email signatures in a more extensive way than it is possible natively. Define conditions and actions to determine which signatures and disclaimers and under what circumstances will be added to your emails. Once the program is all set up, it automatically adds signatures to your online correspondence. You can create and apply various email signatures for different users or group of users, e.g. signature designed for people from marketing department may differ from the one for sales persons. Tell the program which signature is for whom and let the program do the rest. Manage email signatures and disclaimers for everyone in your organization from one place. Add legal disclaimers to all emails to comply with legal requirements concerning online correspondence. You can create unified signatures for all employees in your company but at the same time keep them fully personalized. Thanks to Active Directory placeholders, you can have each signature filled in with personal information of a specific user. Make your signature more attractive by decorating it with your company logo, employees’ photos, images or marketing banners. All that can be smoothly achieved thanks to a build-in HTML editor equipped with all popular formatting tools. Thanks to this functionality, the program can add any information to your signature in form of QR codes that can be easily copied and saved by mobile users to their phones. Generated on the fly, QR codes can even consist of Active Directory placeholders that are filled in automatically. Thanks to the fact that this program adds signatures directly on the Exchange server, it supports all email clients and mobile devices, provided that the entire email flow goes through that server. This way you can send emails from, e.g. iPhone, Android, Blackberry, Outlook or OWA and still enjoy your massages being stamped with professionally designed email signatures. The program is equipped with an easy-to-use template editor, which will help you to design nice HTML, RTF and plain text email signatures and disclaimers. Just in a few clicks, add images and social media buttons, hyperlinks or tables. Modify the text using popular formatting tools. If you want to see how your signature presents in already sent email message, you can configure Sent Items Update service so that all emails stamped with the signature will be updated in Sent Items folder in your email client. Thanks to CodeTwo Exchange Rules 2016 you can manage clickable marketing banners and add them to your email correspondence to boost marketing campaigns. You decide what you want to promote and when, the program will help you achieve that in an easy way. You can tell the program where in the email message you want the signature to be inserted. Decide whether it should appear right under the latest response or maybe at the very bottom of an email thread. When your signature is created and the rule is configured, you can test your settings by sending a test email using a built-in Rules Tester. If everything looks as expected, you can start using this rule in a real environment. You need just a couple of moments to install the program on your Exchange 2016 and then enjoy its simplicity of use. Load one of predefined email signature templates available in Templates Library to test the software quickly. Fully functional trial valid for 30 days! Download a free trial of CodeTwo Exchange Rules 2016 and test the program in your environment for 30 days. In case of any questions during the trial period, feel free to contact our technicians via phone or email. They will also help you to extend the trial period if you need more time for testing. No matter what the reason is, you can return the product within 30 days of purchase date, no questions asked. Centrally add personalized email signatures, disclaimers and marketing banners to emails sent from the Exchange Server 2016 environment.